This entry was posted on March 23, 2019 by Herb. WOODSTOCK, Georgia (March 23, 2019) – Brandon Robinson (No. 44 Kennedy Racing/Armbruster Racing Indian FTR750) accomplished what few riders have in recent American Flat Track history in Saturday night’s thrilling Yamaha Atlanta Short Track presented by Cycle Gear. 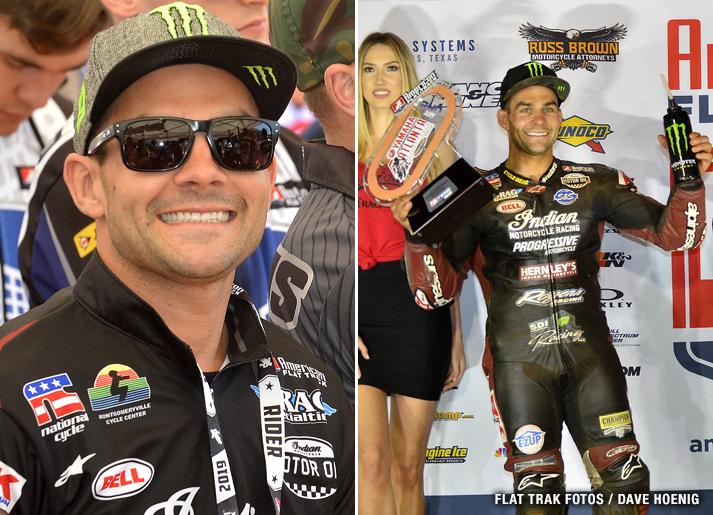 Robinson successfully tracked down, and ultimately dispatched, dominant double defending Grand National Champion Jared Mees (No. 1 Indian Motorcycle/Progressive Insurance FTR750) to win the 25-lap AFT Twins presented by Vance & Hines Main Event at at Dixie Speedway in Woodstock, Ga. Prior to Robinson’s heroics, Mees appeared set to issue a stark reminder of that dominance when he broke free early and worked up a gap to separate him from the remainder of the field. However, Robinson slowly reeled Mees in throughout the Main, finally arriving on the champ’s rear wheel with just over five laps remaining. On lap 22 of 25, Robinson made the race’s decisive maneuver, pulling off a skillful outside overtake to steal away the position. Mees had no response, as Robinson immediately dropped him en route to a slim 0.621-second margin of victory.